We will use Delphi to create a simple program and run it. Double click on Console Application. On file menu, click on Save and save the program in a suitable folder as HelloWorld.dpr. 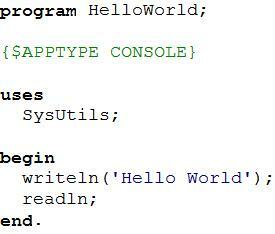 Delete the line between begin and end then type the lines writeln('Hello World! '); followed by readln; in their place. Carefully check that every character is correct. Especially check that the single quotes and the semi-colons are there. The time has come to compile and run the program! Press the green triangle near the top left of the Delphi menu bar, OR press the F9 key. In case you were wondering, the file will be saved automatically, so you do not need to save it first. If it did not work, you will need to check again for errors, and correct them before clicking on the run icon again. Carefully check that every character is correct. Especially check that the single quotes and the semi-colons are there. The green start icon has now changed to grey, indicating that the program is still running, and that consequently the icon is inactive. 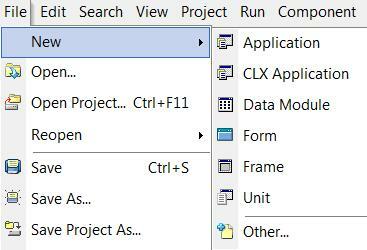 There is a blinking white cursor (a horizontal bar) on the black window, indicating that the program is awaiting input (due to the readln; statement). Press the Return key again, to make the program terminate. Alternatively, you can move on to another topic.